In this podcast, Dave Korsunsky, founder of Heads Up Health talks with Carole Freeman (also known in the ketogenic world as “Keto Carole”) about understanding how to control your appetite better. Carole is a Certified Nutritionist with a dual Masters of Science in Nutrition and Clinical Health Psychology, as well as a licensed Hypnotherapist. 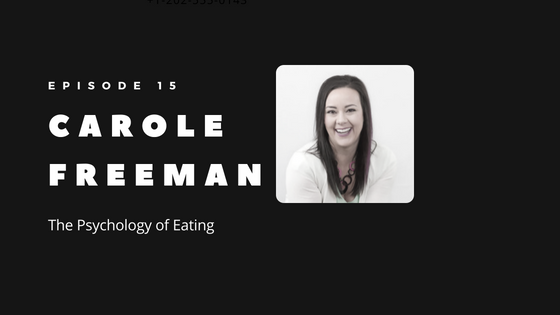 Understanding the psychology of eating gives Carole a unique perspective on creating a personalized keto diet while bringing in a whole body approach to her work with clients. Carole’s journey into the ketogenic diet world began after suffering a traumatic brain injury in 2014 where she was in debilitating chronic pain from a motor vehicle accident. She used her educational background to dig deeper into the research on ketogenic diets and how they can support brain health, and began modifying her own diet. As she began this therapeutic ketogenic diet to heal her brain, she also began to see a whole body transformation and knew she had to help others with this lifestyle. Now, Carole runs a nine-week online coaching course to help individuals with metabolic issues to be successful in lowering their blood sugar, insulin, and other inflammatory markers through dietary changes. What makes Carole’s program so successful — she has a weeks-long waiting list — is that she understands the psychology of what can sabotage a healing diet. She can anticipate the areas where clients may struggle and help to prevent them from having to go through the frustration that can sometimes occur. Helping clients understand “their WHY” for staying motivated, as well as understanding why they feel like they can’t avoid some of the most sabotaging foods, empowers them to have the success that they haven’t been able to achieve on their own. This podcast is brought to you by Heads Up Health. a web app designed to help you centrally track all of your vital health data. Instantly synchronize your medical records, connect your favorite health devices and apps and use your data to optimize your health!